Companies strives to upscale and evaluate their efforts prior to investing further in any rising opportunity. 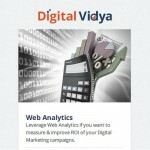 When it comes to advertising online, web analytics occupies a pivotal role in its incessant success. Web Analytics is that form of Digital Marketing which helps in optimizing, analyzing, reporting and measuring the web performance of any website. This has lead to a surge in demand of web analytics professionals across the world. Certified Web Analytics Masters Course (CWAM) is a great platform for the participants who wish to develop an expertise and masters in Web Analytics. This course allows participants to excel their skills in one of most evolving domains of Digital Marketing, viz. Web Analytics. This course is best suited for professionals and graduates keen to build a successful career in their domain. It is also well suited for those who are already working and would like to take certification for further career progression. Earning skills Web Analytics Master Certification can help candidate differentiate in today’s competitive job market, broaden their employment opportunities by displaying their advanced skills, and result in higher earning potential. How to be CWAM certified professional? Step 2: Go through the course content which is included with this offer. Step 4: Clear the exam with 70% marks to earn this Web Analytics certification. Note: You would need 10-15 days to prepare yourself for the exam. Also, please make sure that you book your exam at least 15 days in advance. What will be covered in the CWAM Exam? Note: All preparation material for this Web Analytics Master certification will be provided to you with this limited time offer.